Reports have improved this week and those that have been out have said there are very few fisherman about but plenty of fish! Eucumbene:- Eucumbene trolling reports have been good this week. Past reports suggested deep fishing was the optimum but reports this week have been good with Tassies and Cobras on flat lines. 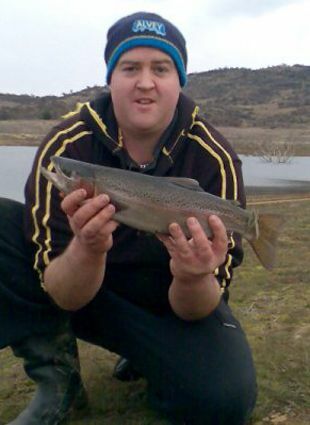 *Chris Mould from Cooma spent a few cold hours around lunch time on Sunday for five nice rainbows. 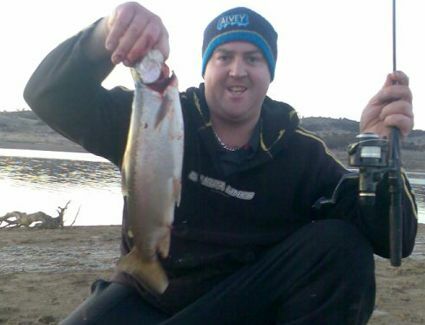 He and a mate persisted despite the cold blustery wind and the best fish was a mid 40's cm rainbow. Hot pink and yellow Cobras were the pick of the colours. Chris said he only saw one other boat on the water. The Coppermine and Collingwood bay areas are good places to troll currently along with the Braemar and Dam Wall area of the lake. Fished seven gates from the bank last night (10th of July) for 3 rainbows and 1 brown on power bait and scrubbies. All were caught between 8pm through till 10.30pm which included dropping one and also a double hook up. The biggest was a rainbow of 43cm and the smallest also a rainbow at 38cm. To my daughters delight daddy caught some fish and cannot wait until she is old enough for overnight fishing trips. 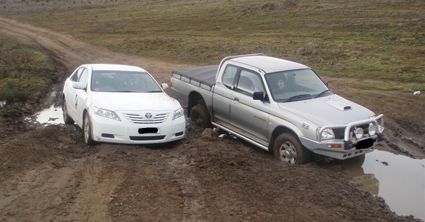 Just had to include a photo of two bogged cars I came across the next morning on my way out. Those of you who know Seven Gates will pick where it is straight away. Obviously common sense went out the drivers side window of the Camry. But to get the triton bogged as well??? Anyway as no one was there I couldn't offer any assistance so continued on my way through the mud (in 2wd) as I did on my way in. With lake levels dropping err on the side of caution and if in doubt, don't, as I'm sure surrounding property owners get jack of pulling people like this out of the mud. 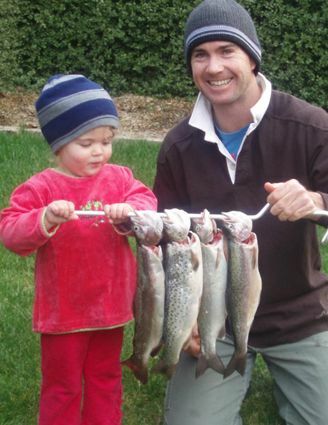 *Hi the trout fishing has been really good this year with strong numbers of trout being taken from Eucumbene , Ive been at Seven Gates or the Dam Wall every week and have not come home empty handed yet . I was at Eucumbene Dam Wall Friday lunch and left Sat lunch with a full bag , conditions on Friday were perfect so I had to take the day off to be there for the afternoon fish which proved to be a worth it. The fish were hitting the lines hard all afternoon on power bait , chartruese , lime twist and orange pulp are my main choice . Ninety percent of my trout fishing is done over night and usually provides big consistant numbers of fish, the average size this year is around 40 to 45cm and larger ones are not uncommen now. Here are some photos from Friday and Sat morning. 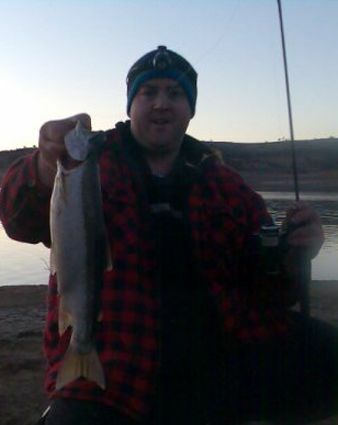 Jindabyne reports have been scarce though there should be some good fish to be had on grubs on Powerbait. Fished Kalkite for two hours from 5 pm to 7 pm on Saturday and got a 800 gram rainbow on rainbow powerbait. Other than that, it was a pretty cold and windy evening.